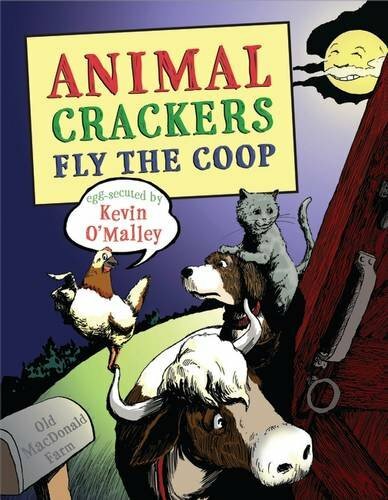 Animal Crackers Fly the Coop is a hilariously funny book that children will love and repeat the jokes in forever. Animal Crackers Fly the Coop begins with a hen that likes to tell jokes. Not being happy with his life of laying eggs, Hen leaves to find a better life for himself, having a dream of opening up a comedy club. Along his journey, he meets other animals that want the same thing as he does, a more satisfying and funny life with animals who understand them. He meets up with Dog, who is also a comedian; Cat, who wants to be a performer; and Cow, who loves telling jokes. The foursome join forces. As they continue on together, they soon come across an old house where they find three robbers inside. All the animals are focused on the tasty food that is sitting on the table and the nice and comfortable place to sleep, so they wait for the robbers to leave before entering. When the robbers return home, the animals scare them. Out of nervousness, the animals begin to tell jokes. The robbers, clearly not able to understand what the animals are saying, soon run off, leaving the animals the house. Realizing their good fortune, the animals keep the house and turn it into a comedy club where animals from all over come to listen to them tell jokes. The Grimm Brothers’ fairy tale The Bremen Town Musicians was the inspiration for this story. In that fairy tale the animals of the story become musicians, realizing that each animal has a specific talent that meshes well with the group. Mr. O’Malley goes another way with it, putting more humor into the story, which the reader will appreciate. His animals tell jokes and though some jokes are hysterically funny, some are also very corny—but all will put a smile on the reader’s face. This reviewer’s only concern was that younger children might miss some of the humor. Adults will catch it easily, so will older children, but when this book was read to a group of children of various age groups, though the children immediately laughed upon hearing the jokes, younger children didn’t understand some of the humor. This book is best read with the intention of explaining some of the humor and how it relates to the specific animals. Otherwise the author’s meaning will get lost with the younger readers and they are the ones who should be enjoying this story the most. The illustrations in Animal Crackers Fly the Coop, a 40-page story, depict the humor well. Children will laugh at the cleverly written story. And kids who love telling jokes will surely use its contents to add to their repertoire. This hardcover picture book is great for children between the ages of 4–8.